I am blessed to work in a private school that still offers a full hot lunch program. 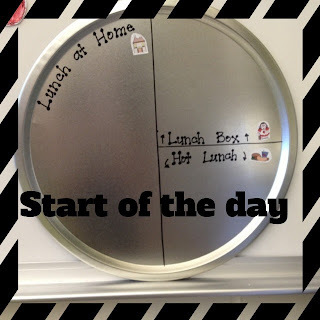 Each morning, the students have to let me know what it is they will be doing for lunch. Are they going home or staying at school for lunch? Are they leaving after lunch or staying all day? Did they bring a lunch box? Do they need to order a hot lunch? WHEW - are you confused yet? 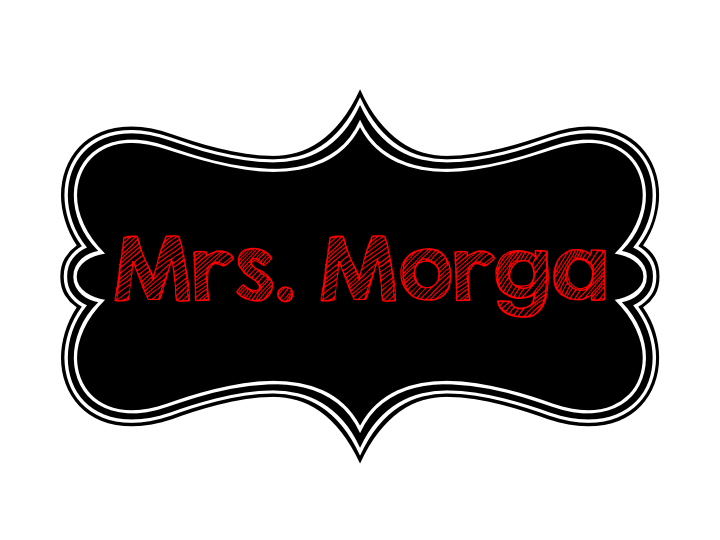 Well, you can only imagine how difficult this can be at the beginning of the year for my sweet little kinders. Red apples - These are my half-day students that leave at the 12:00 dismissal. Yellow apples - These are my half-day students that choose to stay for recess and lunch, but leave right after lunch. Green apples - These are my full-day students that stay until the end of the regular school day. 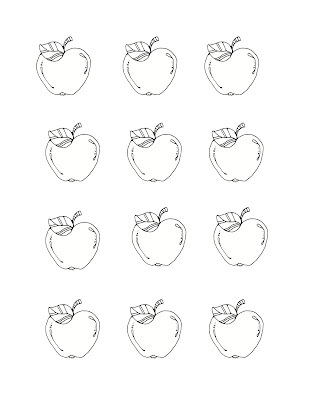 In order to help the students with this, they each color a set of apples on the first day of school. They are given three apples, and color one red, one yellow, and one green. Before I give them the apples, I've added a text box and put their name on it. I left them blank so that you can add names via the computer or by hand...whatever makes your heart sing! 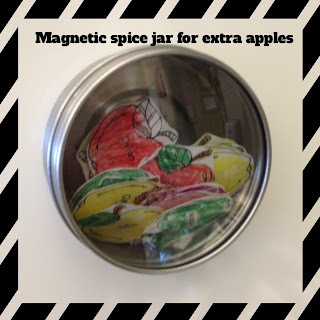 After they are colored, I laminate them, cut them out, and add a small piece of magnet on the back. Now here comes the fun part. 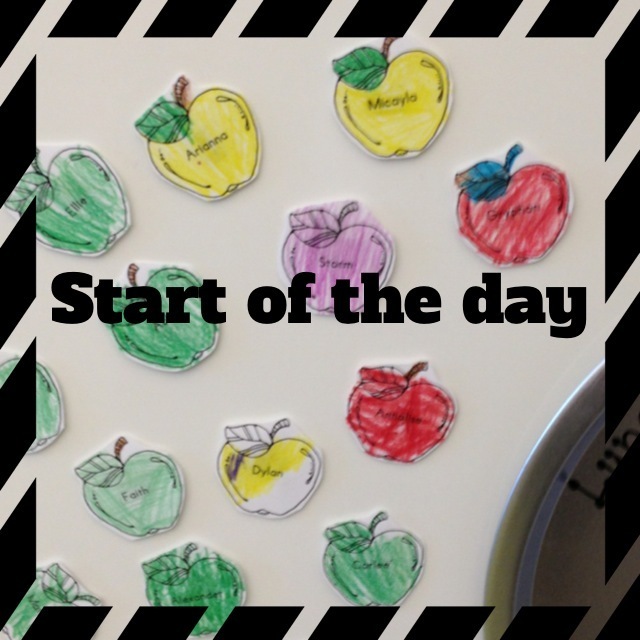 Each morning, students have their apples on the board. I use only the colors that I feel they are the most...that way I don't have a million apples all over the board. All extras are in the jar on the board. When they come in, they put their apple on the correct choice. Then, after it is time to start the day, I simply ask the students what they would like for lunch. We have a main hot lunch choice that changes each day. Or, there are three other choices that are the same every day. The chart is just a simple pizza cooking sheet from the Dollar Store. I glued some magnets on the back. In the beginning, it takes just a few minutes. But by the third week of school, we are pros. So proud of them! Now, if you teach in a school that ONLY offers full-day or half-day Kindergarten...COUNT YOURSELF LUCKY. Ha! You can just have them color an apple and call it a day. 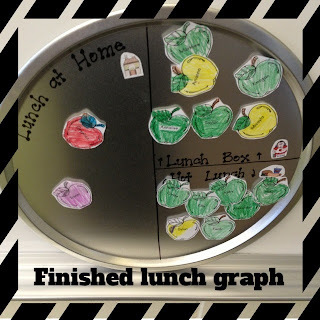 Enjoy getting a little more organized with lunch!